Atlanta Hawks power forward Paul Millsap (4) and Cleveland Cavaliers power forward Tristan Thompson (13) battle for the ball in the second half at Philips Arena. After entering the Christmas break on a sour note, the Atlanta Hawks and Cleveland Cavaliers are both looking to get back on track. 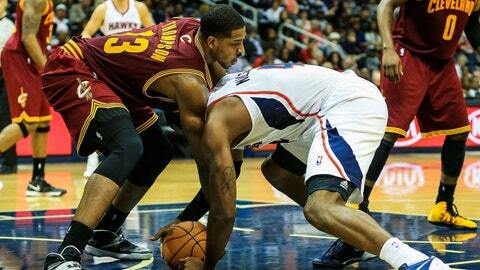 The road-challenged Hawks try to continue their recent success against the Cavaliers on Thursday night. Atlanta (15-13) had outscored opponents by an average of 21.4 points during a season-high three-game winning streak before suffering a 121-119 overtime loss at Miami on Monday. Jeff Teague scored 26 points and Paul Millsap added 25 and 10 rebounds, but the Hawks blew a seven-point lead with 90 seconds left in regulation. "Our group competed tonight and our group improved tonight, and I think that’s one of the things we’ve been talking about all year, is that we want to compete and we want to improve," coach Mike Budenholzer said. "I’m proud of our group. Obviously we would have liked to have won the game." The Hawks, who went 17 of 34 from 3-point range, are averaging 118.8 points over the last four games. "There’s a lot of good things that we did." said Millsap, who made a career-high seven 3s. "Things are clicking. We feel like we’re getting better. So just take the positives and leave the negatives here." Atlanta, though, has had a rough time on the road, where it’s given up 111.0 points during a five-game losing streak. However, the Hawks have won 10 of 12 against the Cavaliers, including four of five in Cleveland. The Cavaliers (10-17) are coming off a pair of ugly defeats, falling 100-84 at Chicago on Saturday and 115-92 to Detroit on Monday. Kyrie Irving had 21 points but Andrew Bynum was held scoreless for the first time this season after going 0 of 11 from the floor. Cleveland, which was outscored 58-40 in the paint and 19-7 in transition, was also outrebounded 50-39 and limited to 38.6 percent shooting. "Our sense of urgency the last two ballgames has been non-existent," coach Mike Brown said. "I don’t know if we mentally understand what it takes to keep doing this every time we step out on the floor. We’re getting hit in the mouth right now and I’m interested to see if we can respond the right way." The Cavaliers, giving up 101.7 points per game, are 3-11 when allowing 98 or more. "All of us can see the mistakes that we’re making defensively," Brown added. "That’s something that we’re going to correct. I’m going to keep moving pieces and searching until I feel like I have a group of guys that are going to consistently play at a high level defensively. We have to rebound, defend and be physical out there without fouling." Cleveland, which is surrendering 41.3 points per game in the paint, could have its hands full with Al Horford. The All-Star forward is averaging 23.2 points – 4.9 more than his season mark – and shooting 64.6 percent in the last six games. The Hawks are 10-3 when Horford scores at least 19 compared to 5-10 when he doesn’t. He had a team-high 22 in a 108-89 rout of the Cavaliers on Dec. 6. Irving, meanwhile, went scoreless in that game while going 0 for 9 from the floor. The All-Star guard had averaged 25.4 points in his first five matchups against the Hawks. Irving is posting 26.6 per game over the last seven overall. Dion Waiters, who scored a season-best 30 against Atlanta, may miss his fourth straight game with right wrist tendinitis.